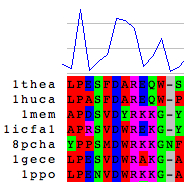 Reticular Alignment is our new method for for multiple sequence alignment. Unlike previous corner-cutting methods, our approach does not define a compact part of the dynamic programming table. Instead, it defines a set of optimal and suboptimal alignments at each step during the progressive alignment. The set of alignments are represented with a network to store them and use them during the progressive alignment in an efficient way. The program contains a threshold parameter on which the size of the network depends. The larger the threshold parameter and thus the network, the deeper the search in the alignment space for better scored alignments. We implemented the program in the Java programming language, and tested it on the BAliBASE database. Reticular Alignment can outperform ClustalW even if a very simple scoring scheme (BLOSUM62 and affine gap penalty) is implemented and merely the threshold value is increased. However, this set-up is not sufficient for outperforming other cutting-edge alignment methods. On the other hand, the reticular alignment search strategy together with sophisticated scoring schemes (for example, differentiating gap penalties for hydrophobic and hydrophylic amino acids) overcome FSA and in some accuracy measurement, even MAFFT.